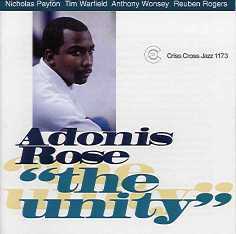 For his second release, The Unity, Adonis Rose, the exciting 25-year-old drummer from New Orleans, is joined by the same cast of young talents - including that rising jazz star, trumpeter Nicholas Payton - who helped make his debut disc so memorable. Rose both supports and propels the quintet with his strong percussive drive, and also reveals his writing gifts in three original compositions. On tenor the great Tim Warfield, on the piano bench Anthony Wonsey, bassist is Reuben Rodgers. Tim Warfield and Anthony Wonsey recorded as leaders for Criss Cross before. This group is normally working as the Nicholas Payton Quintet.